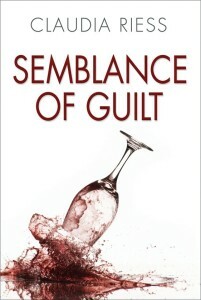 SEMBLANCE OF GUILT is the story of ELLEN DAVIS, a recently divorced local reporter who is set up as the murderer of a new friend, and with the help of a detective on the case, PETE SAKURA, finds herself in a race against time to uncover the evidence that will save her. Ellen’s husband has recently left her for another woman, and she is trying to reassert her independence. She starts writing for the local newspaper, where one of her assignments is to cover weekly items in the police blotter. When she travels to the station to pick up the information, she meets her contact, Pete, a handsome, witty Japanese-American, and she is immediately drawn to him. Another of Ellen’s assignments is to cover recent additions to the community in her “Around The Town” column. It is through this task that she meets GRAHAM and SOPHIA CLARKE. He is an administrator at Columbia; she, his beautiful Greek wife. Ellen and Sophia become fast friends. While visiting Columbia one afternoon, Ellen inadvertently catches Graham in the company of another woman, and briefly investigates on Sophia’s behalf. This innocent act proves to be the start of Ellen’s undoing. For reasons unbeknownst to Ellen, Sophia begins to suspect that she and Graham are having an affair. Then, Sophia is found murdered and to all appearances, Ellen is the last person to have seen her alive. When her fingerprints are found on the murder weapon, she is arrested. Prior to her indictment and as her trial progresses, the evidence mounts against her. As it begins to point overwhelmingly to Ellen as the guilty party, she must take matters into her own hands and prove her innocence. As her efforts to save herself intensify, so do the romantic feelings she shares with Pete. It is a complex relationship with mysteries of its own, and can either save them both or lead to utter disaster. A determined amateur detective who’ll garner fans with her refusal to back down or give up.